The Brotherhood's Morsi: A revolutionary candidate? A military source who spoke to Ahram Online on condition of anonymity spelt out the ruling military council's position on Egypt's current uncertain political situation, in which the Muslim Brotherhood appears to stand on the verge of winning the presidency. 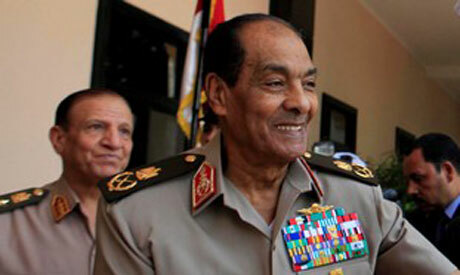 "The military council is determined not to allow the Muslim Brotherhood to seize power," said the source. "It will not relinquish the reins of power until a new constitution is issued and the arena is set for a balanced political process." "There are political forces that want to discredit the political process by making people believe that matters are being decided by political deals," he added. "To avoid any sudden shifts that could lead to confrontation and drive the situation to the brink, the military council remains the only force capable of regulating the political process so as to preserve the stability of the state." "The United States and the European Union have both been sending messages reflecting their preference for [the Muslim Brotherhood's] Mohamed Morsi as Egypt's president," the source said. "In the belief that they enjoy this support, the group has adopted a policy of pressuring Egypt's interim rulers regarding upcoming political arrangements." "Moreover, the Muslim Brotherhood's guidance bureau has been exchanging messages with the US – to which Israel is privy – containing reassurances about the group's stance on Hamas, Gaza and the Camp David accords," he added. "It remains unclear, however, whether the US would prefer to see Morsi or Shafiq in Egypt's highest office." The source further explained that the Muslim Brotherhood had escalated the situation to the point where it had "unacceptably" protested the recent High Constitutional Court verdict that led to the dissolution of Egypt's Islamist-led parliament and attempted to monopolise the Constituent Assembly responsible for drafting a new constitution. Any future talks between the two sides, therefore, the source said, "will be of a confrontational, rather than friendly, nature." "For the first time in its history, the Muslim Brotherhood is adopting a confrontational attitude, after having long depended on a policy of negotiation," the source said. "Their performance during the transitional phase put them in a weaker position than ever, and now they're doing everything they can to regain their popular support base." Following the constitutional court ruling that led to parliament's dissolution, the military council issued an addendum to last year's Constitutional Declaration, in which it reassumed parliament's legislative powers until fresh parliamentary elections can be held. It also assumed the authority to select constituent assembly members, which had, under last year's Constitutional Declaration, been the sole prerogative of Egypt's first post-Mubarak parliament. Final results of Egypt's contentious presidential runoff will likely be announced on Saturday or Sunday, according to a Wednesday statement by the Supreme Presidential Elections Commission. The announcement had originally been scheduled for Thursday. So, in 15 years or so when the MB does have control over parliament and the presidency, will the SCAF step in and kick them out? The elections were held, the people voted for who they wanted in power, time to live with it! Egypt has gone from one dictatorship (Mubarak) to a new dictatorship (SCAF).